Srey Pot Mom and Ben Sarith eat a dinner of steamed rice and beef soup with gourd. The slat table on which they sit serves as dining table, kitchen counter, living room sofa, and bed. Their room, like all of their neighbors’, is just big enough for a person to squeeze between that slat bed and the wall. Most apartments this size sleep 3, 4, even 8 people. Srey Pot Mom and Ben Sarith both have factory jobs during the dry season. When the rains return, they will head home to their countryside farm. The New York Times has a story this week on Cambodia’s economic uptick as companies—notably, factories—shift business from China to Phnom Penh. The article, I think, leaves the impression that Cambodian wage-earners benefit from that trend. But the piece neglects a key voice that might offer a more nuanced perspective: the voice of the worker. It’s true: Phnom Penh bustles with business, and the streets clog with trucks escorting workers to and fro, and industrial centers sprout from the former rice paddies that surrounded the city not long ago. Big-name brands and international corporations increasingly claim Cambodia among their places of work. And the minimum wage for factory employees goes up and up (again next month, to $75 plus a $5 health allowance). Good, right? 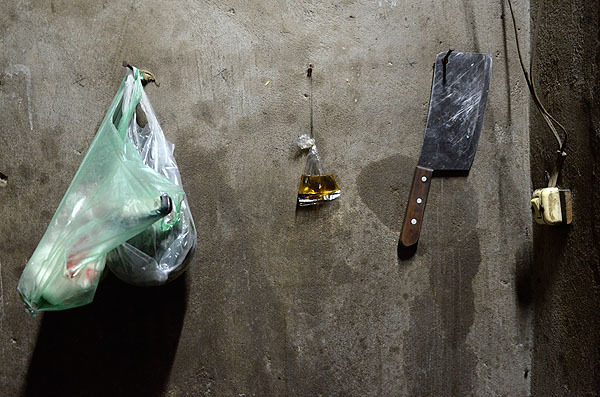 One family’s kitchen pantry hangs on the wall: a bag of market food, a small bag of oil, and a cleaver. Eight people live in this room about 12 feet by 16 feet. 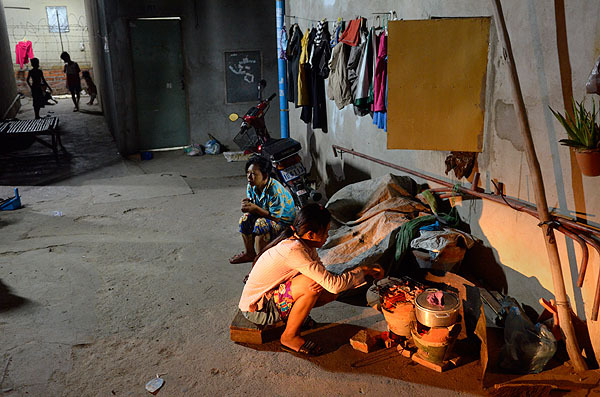 An ailing mother sleeps on the bed while a relative cooks dinner on the floor beneath it. All the healthy adults in the family work in factories. They came to Phnom Penh from the countryside to pay for their mother’s hospital bills. But here’s what happens: salaries go up, and so does rent. So does the price of food. When government approves a minimum-wage increase, it’s in the news. Everyone knows. Landlords know, vendors know, drivers know. And the workers pay. Most factory workers come from the countryside. They are farmers, but few can survive on farming alone these days. So they come to the city in the off-season, hoping for work. Or they come to the city when a kid gets sick or a storm wrecks the roof or they run out of food. And then they search for work—not with hope, but dire need. Many workers plan to save what they make and send it to relatives back home. Or to pull themselves out of debt. Or to send their kids to school. Or to find a better life. That’s the plan. But what they say, at home, at night, in the cramped quarters they share in a neighborhood maze with hundreds of other workers, is this: very little goes according to plan. They are happy to have work, but sick in mind and spirit to be working their fannies off all day long, every day, with no spare riel to save. And when the money runs thin, they eat less. They grow weak, and tired, and they often get sick. A woman cooks dinner in the alley behind her apartment. Clothes hang on the wall—the rooms have no space for closets or dressers. But the cycle continues—it doesn’t pause for the time they need to heal. The workers go to work. They sew buttons on shirts and zippers on pants that get packed into boxes destined for department stores and strip malls in every corner of Europe and America. We all wear the labels, we all shop at the stores. They are everywhere. And the work of these men and women hangs on all of our backs. 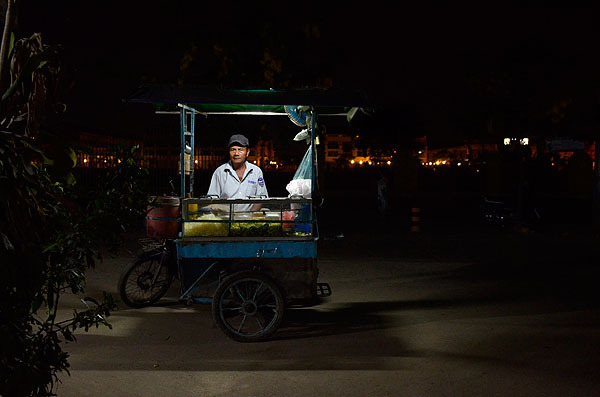 A vendor sells papaya salad to factory workers outside their apartments. Thank you for this other point of view. It is very moving. I’m curious, though, how you got the photos. Not trying to sound like a smartass, but it wasn’t too complicated. I walked up, introduced myself, joked around a bit, and took photos. Cambodians are astonishingly friendly people. You should go! Zapatistas warned us about this years ago. A very touching post. And the photographs are so detailed and up close and personal. Someone should demand those factories pay a reasonable wage… so they move to another country where it’s cheaper… and send those workers back the the fields.